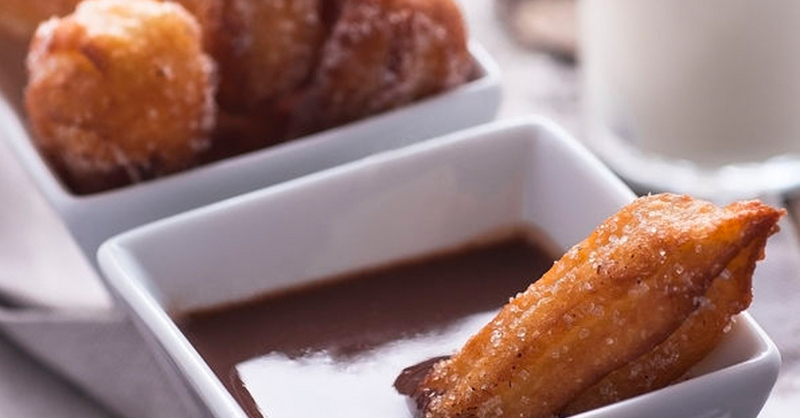 Making The Famously Delicious Churro At Home Is Pretty Easy When You Break Down The Steps! Churros are a decadent sweet that remind us of a few, different things: fairgrounds, Mexican hot chocolate, warm tummies and happy times. Rolled in sparkly sugar, these hot, fried, dough sticks are such a treat, made even more special when paired with a spiced chocolate dip. This dessert is not one that immediately comes to mind when we think of easy kitchen projects, but once it’s broken down, the process really isn’t that difficult. If you want to be transported back to your childhood memories (or whenever it was when you tried your first churro), try these and be prepared to make extra, because it’s hard not to get carried away once you’ve tasted your creation! Place a large saucepan over medium-high heat and bring butter, 2 tablespoons sugar, cinnamon stick, salt, vanilla and water to a boil. Remove cinnamon stick and stirring continuously, add flour and cook until a smooth dough forms. 4-6 minutes. Pour dough out into a bowl and stir in egg until completely combined and incorporated. Spoon mixture into piping bag fitted with star tip and set aside. In a paper bag or baking dish, combine remaining sugar with ground cinnamon and shake or stir to combine. Use a thermometer to heat the oil to 400º F. Hold piping bag directly over oil and gently squeeze out 4-6 inches of dough. Use your finger to quickly cut off the end of the churro and carefully drop it into the oil. Note: you can pipe churro dough in straight lines or in different designs/shapes. Use a slotted spoon to remove churros from oil and transfer to a paper towel-lined plate to dry. Then, place churros in paper bag or in baking dish and toss with cinnamon sugar mixture. Before serving, place chocolate, vanilla, cayenne and cinnamon in a heat-proof bowl. Heat heavy cream in a medium saucepan until just about to boil, then pour over the chocolate and spices. Let sit 1 minute, then whisk until melted and smooth.